Laura Brandenburg, Jessia Saros and Shawn Saros. 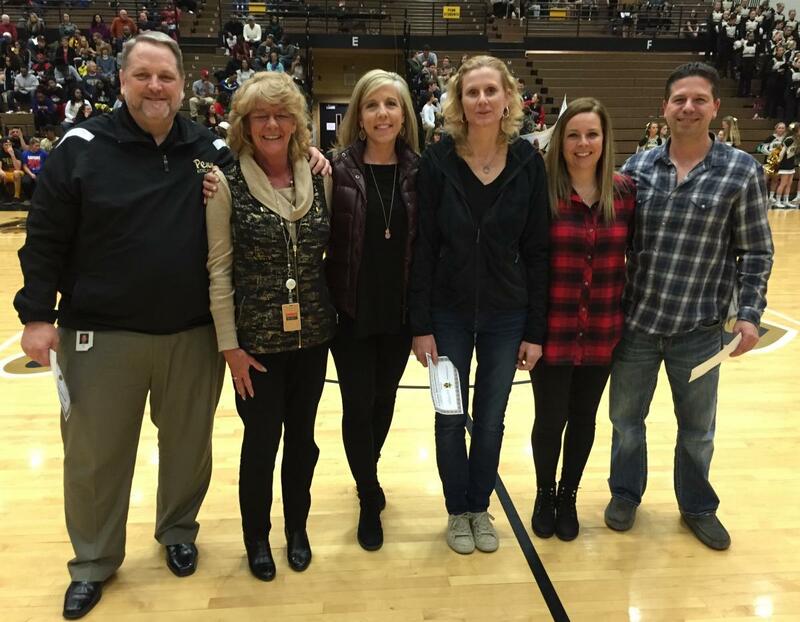 Penn High School principal Steve Hope honored the Penn High School Parent Teacher Organization before the Penn boys basketball game on Thursday, Feb. 4, 2016, PTO for its efforts in helping make Penn an elite school. “The Penn PTO is comprised of some incredibly dedicated parents who work not only as a liaison with the Penn administration and faculty, but also as parent leaders ready to support Penn students in all areas,” Hope said. The PTO serves as a liaison for all 7,000+plus Penn parents, working with the Penn administration and communicating with all Penn parents. The Penn PTO recently completed its biggest event of the year, the annual Snowball winter dance. Hope and Moran also acknowledged the great work done by Zuidema in securing parent volunteers from the opening of school to Snowball to AP testing at the end of the year. Hope and Moran also acknowledged the efforts of two Penn parents, Shawn and Jessica Saros, for their extraordinary work in the success of this year’s Snowball. Shawn and Jessica Saros secured many donations from area businesses and transformed Penn High into an incredible dance hall, making a remarkable night for all Penn students. Hope commended the outstanding work of Penn’s Parent Teacher Organization, Parent Volunteer Coordinator, and the many members of our school community who donate their time unselfishly to support all Kingsmen activities.